At 12:01 on Saturday the 15th of February, the Governor of South Australia is expected to issue the writs for the South Australian state election. With the electoral cycle about to start officially, it is time to get into high gear, take our calculators out of the mothballs and do a lot of other symbolic activities. This week we begin to refine the information to formulate our predictions. 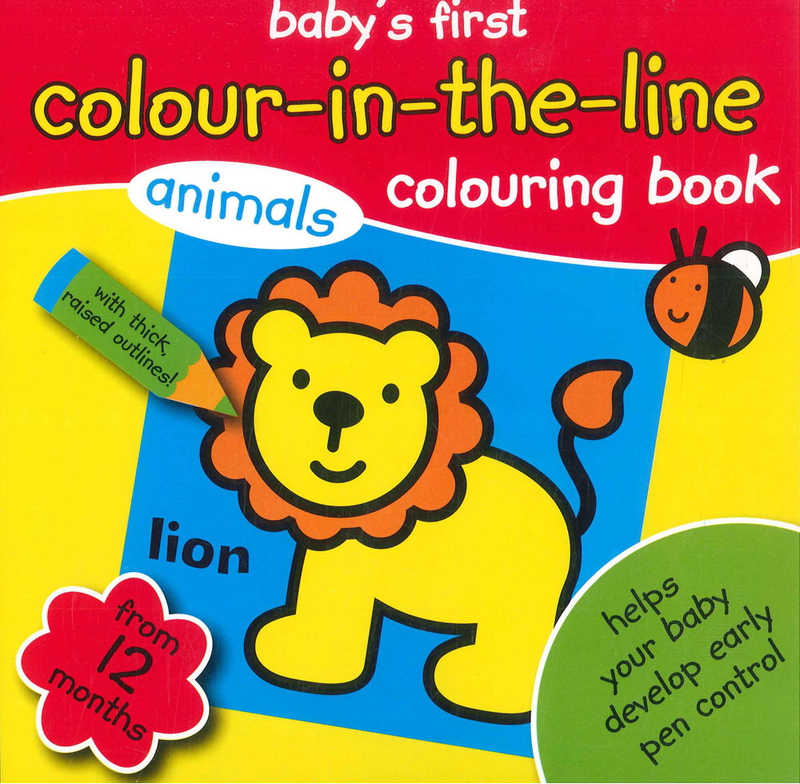 And what better place to start than by colouring in some maps? If it were possible to sit back and enjoy whilst simultaneously perching on the edge of your seat, I would advise it now as we enter a weekend of electoral map colouring in a three-part Mapstravaganza! The last couple of months for me have been a montage of pencil sharpeners and colouring books. Each election contributes roughly 4.2% of the total colour. Seats from 1938* are at 100% opacity, but more recently created seats such as Little Para (which has only contested two elections) are significantly paler. Blue now includes current Coalition parties (Liberal, Nationals) and precursors to these (Liberal and Country League, Liberal Movement**). Affliliated Independents (e.g. Independent Liberals Stan Evans in 1985 and Keith Russack in 1977) are coloured grey, as these often ran against (and took seats from) the recognised candidates for their own parties. Grey also includes the Single Tax League, who won Flinders in 1938. Where seats that have earlier incarnations (Enfield 1956-1970; Port Adelaide 1857-1970; Stuart 1938-1993 and West Torrens 1857-1902, 1915-1938, 1956-1970) only the most recent version of that seat is included. Where a seat has its names changed but is not modified in any other way, data from the previously-named seat is also included. Dunstan was named Norwood until 2014 and MacKillop was Victoria until 1993. This next map only considers electoral data from the last 5 elections (1993, 1997, 2002, 2006 and 2010). Over half of the current electoral districts were present by the 1985 election with the additions of Bright and Ramsay, but a further 10 were added two elections later, making 1993 arbitrarily the beginning of the following map. Now don't worry -- there are Variable Dependent Transparency Arrays to follow as well, but at the risk of overdoing the number of maps in one post, these will form the tomorrow's post, and we will then cover the analysis of all of these maps in the final post on Sunday. In the mean time, happy new election cycle everybody! Pretty maps. More to come over the rest of the weekend. Maps of the current standings and averaged history of electorates provided above. VDTA's to follow in part 2 on Saturday. Analysis in part 3 on Sunday. *All data is used from after (and including) the 1938 election. 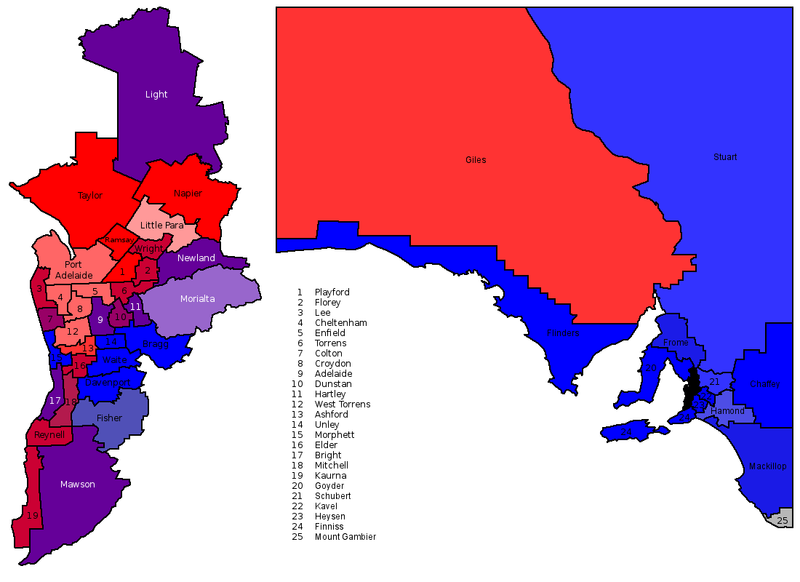 Although South Australian elections can be followed right back to 1857, 1938 marks the end of multi-candidate electorates and begins the era of comparable data. 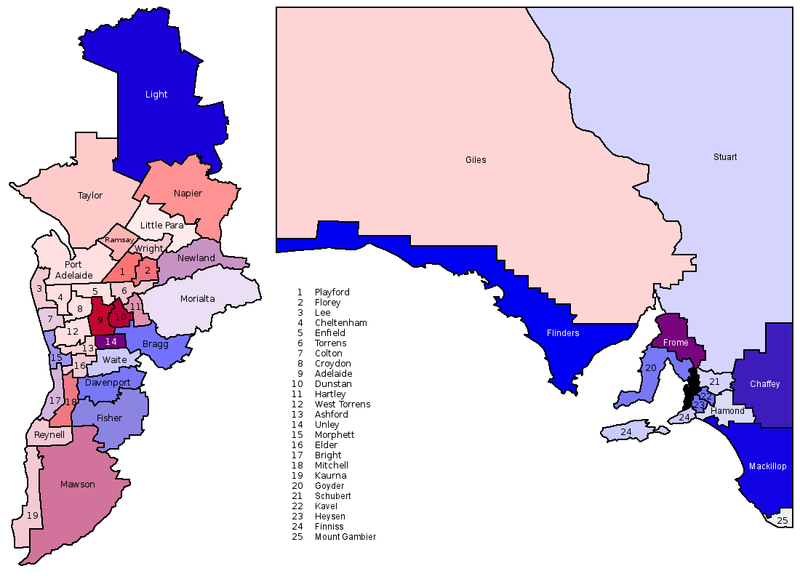 Several current seats had incarnations dating pack to 1857, but only Flinders has existed since then without interruption. ** The Liberal Movement is counted as Coalition, even though a small segment broke away to form the New Liberal Movement and eventaully joined the Democrats.